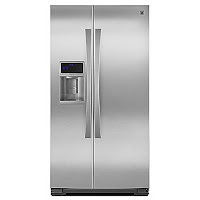 The appliance of the week is the Kenmore Elite 29.2 cubic foot side-by-side refrigerator model 5118X. This model is available in white (51182), black (51189), and stainless steel (51183). The Kenmore Elite 5118X has flat doors (not contoured), and the same "bow tie" design handles to match other current Kenmore Elite appliances. The freezer door has a water/ice dispenser with all the controls for the refrigerator directly above it in a black touch panel. The controls are lit in blue for a sharp, sophisticated look. Hinges are hidden behind the facade of the doors, creating a clean and built-in appearance. Inside the refrigerator, there are 17 cubic feet of storage space. The shelves are tempered glass with a front trim on each and nano-etched spill-proofing. GeniusCool with dual evaporators and SmartSense technology maintains consistent temperature and humidity without letting the odors from the refrigerator enter the freezer. The CleanFlow air filter uses activated charcoal to eliminate odors from the refrigerator cabin. And, the humidity-controlled crisper has a special pouch to keep produce fresh for weeks. The refrigerator door is equipped with four gallon shelves that can accommodate up to 8 gallon jugs. In the freezer, the tempered glass shelves and door bins provide 12.2 cubic feet of storage room. With the icemaker located on the door, more shelf space is free for frozen foods. Two enclosed drawers at the bottom give you enhanced organization options. Plentiful LED lights inside both compartments ensure easy visibility of all the contents, so nothing goes to waste. They also use very little energy to run and don't get hot while they're on, so they don't contribute to loss of cold in the refrigerator or freezer. The dispenser on the door not only gives you ice and water, but can also dispense measured amounts of water, making recipes that much easier to complete. Need half a cup of water? Done. And, it's clean and fresh, which makes your recipes come out that much better. For huge storage capacity, super convenience, and sophisticated styling, the Kenmore Elite 5118X is a model that is worth your time and consideration. Want all of that stuff in a counter-depth model? Check out the 24.6 cubic foot Kenmore Elite 5115X, available in white (51152), black (51159), and stainless steel (51153).